"EMPIRE" VASE, SIGNED "Faberge" in New Unused Condition (no Faberge box). 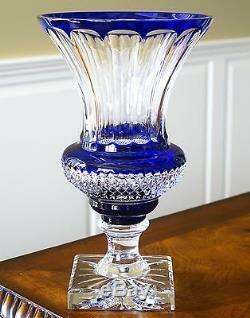 Genuine Hand Cut, Mouth Blown Cobalt Blue Cased Cut to Clear Crystal. 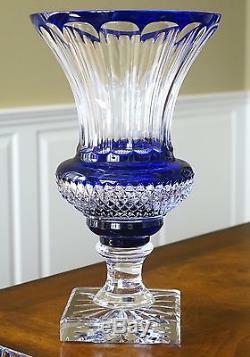 THIS IS A HEIRLOOM QUALITY VASE!!! Check out my other items. 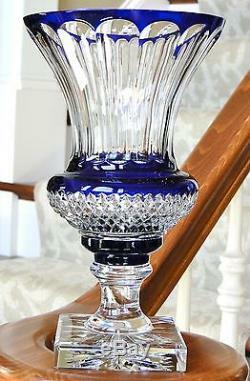 Listing is for one (1) vase as pictured, described and priced. Please note: There are many variations in hand cut crystal. This includes, but is not limited to size, weight, air bubbles and variations in color; which are a natural occurrence in the manufacturing process of mouth blown, hand cut crystal as all pieces are individually formed & cut. This item may not necessarily be an exact match to items you already own. Faberge will soon be one of the hardest collectibles to find as Faberge Crystal closed its doors for good in December of 2009. This is your chance to own a piece of history. Questions, please feel free to contact me - thanks for looking. Be sure to add me to your favorites list. 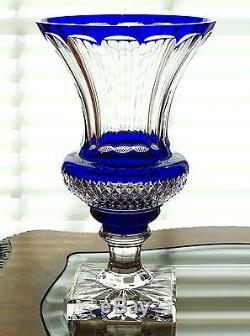 The item "FABERGE EMPIRE VASE 12H SIGNED, COBALT BLUE CASED CUT TO CLEAR CRYSTAL" is in sale since Thursday, September 13, 2018. This item is in the category "Collectibles\Decorative Collectibles\Decorative Collectible Brands\Faberge". The seller is "1mnarmy" and is located in Wales, Wisconsin. This item can be shipped to United States, Canada, United Kingdom, Denmark, Finland, Australia, Sweden, Taiwan, Belgium, France, Hong Kong, Ireland, Netherlands, Poland, Spain, Italy, Germany, Austria, Israel, Mexico, Switzerland, Norway, Ukraine, United arab emirates, Iceland, Liechtenstein, Luxembourg, Monaco.